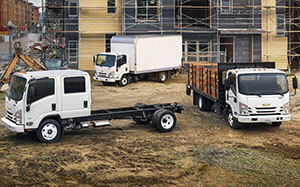 Chevrolet’s new Low Cab Forward trucks are now shipping to Chevrolet dealers across the country. The Chevrolet Low Cab Forward has great customer-focused functionality, including a maneuverable Cab Over design for optimal visibility and a tight turning radius for efficient hauling in busy, urban environments, the company said. The new trucks are offered in regular cab and crew cab body styles, with either a 6.0 liter V-8 gas engine, a 3.0 liter turbo-diesel engine or a 5.2 liter turbo-diesel engine. All engines are mated to six-speed automatic transmissions. Class 3 through 5 models are available with maximum gross vehicle weight rating (GVWR) ranges of up to 19,500 pounds. Pricing begins at an MSRP of $40,900 for trucks with gasoline engines. Pricing for trucks with diesel engines begins at an MSRP of $48,375. Prices include a $1,125 destination charge but exclude tax, title, license and dealer fees.